A little bit of American ‘history’ for a change on Travelmarx. (BTW, did you know the same word in Italian can be used for story and history, interesting.) Virgina city, just a short car ride from Reno, is an example of a mining boom town. At its peak there were something like 30,000 residents. Today there is just a fraction of that. Its claim to fame starts with the Comstock Lode silver strike of 1859. It was largely silver which came out of the Virginia City mines. The depths that they dug looking for ore were incredible. But, alas, by the mid 1870 the pickings started to get slim and by the turn of the century the ore was largely tapped out and the town eventually shriveled. The town was made a National Historic Landmark in 1961 and has rebounded a bit. Some suggest it was helped by the television drama Bonanza (though the actors probably never stepped foot there in the flesh). Today, the town is largely a tourist destination – as far as we could tell. We saw only a small part of it, so advice from Travelmarx is slim. We did take the tour of the “basement” of the main church (red brick, white, just off the main street) which was interestingly narrated. 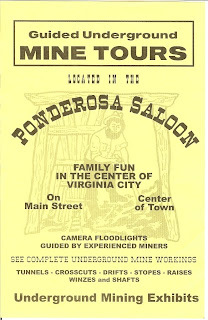 And, we took the Ponderosa mine tour. It’s a short tour you take from a saloon on “C” street. The mine shaft starts in the back of the saloon.